The late A. B. Garretson who was born in Winterset and who after undergoing various vicisitudes in early manhood finally achieved an enterprise which was so far reaching in its results that the whole population of the United States was affected by it. We refer to the Adamson railroad law which affected every one who travels on railroads, ships goods or use anything which is transported by public carriers. He was born in Winterset September 14, 1856, worked at various jobs when a boy, was a grocer clerk and then he left and went into the railroad business, finally located at New Virginia as a station agent. Afterwards he became a passenger conductor on the most important lines in the country. Because he was responsible for the Adamson law, the conductors, who controlled the brotherhood, a fraternal organization to which he belongs elected him as the manager of the union and afterward retired him on a pension which he still had until his death which occurred at Cedar Rapids last year. Mr. Garretson never lost interest in the city of his birth and in later years frequently visited Winterset. He was present by invitation at one of the annual meetings of the Historical society and gave an address in the court room. He also addressed the Old Settlers picnic at the annual meeting at the city park in September, 1930. 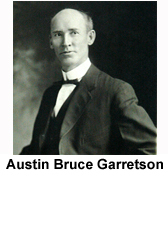 Note: Austin Bruce Garretson died at Cedar Rapids, Linn, Iowa on 27 Feb 1931. Austin B, Garretson, 74, former president of the Order of Railway Conductors, former member of the commission on industrial relations and an outstanding national figure during the great threatened railroad strike crisis in 1915, died at a local hospital at 1:15 a.m. today of heart trouble. Mr. Garretson had been in ill health since October when he suffered a heart attack and was taken to the hospital. He recovered and recently suffered another attack from which he never rallied. His home was 816 A avenue northeast. Mr. Garretson was a native Iowan, having been born Sept. 14, 1856 at Winterset. Strong in the belief that every man should learn a trade, his father, Nathan Garretson, a lawyer by profession, apprenticed him to learn the wheelwright’s trade after he had received a practical education in the school at Osceola. His first railroad experience was his appointment as agent at New Virginia, Ia. On a line that since has become a part of the Burlington system. Later he was in charge of supplies along the line and opened all stations between Osceola and Des Moines. Four years later he became a conductor, which position he held until 1881 when he went to Denison, Texas, where he remained until 1888 with the Missouri, Kansas and Texas railroad. He then became connected with the Mexican National railroad at San Luis Potosi, Mexico, and later was with the Mexican Central railroad at Jimulco, Mexico. Elected By O. R. C.
Returning to the United States in 1889, he shortly after entered the service of the Order of Railway Conductors of North America In 1894 he was elected grand senior conductor. At that time C. H. Wilkins was assistant grand chief conductor. Then Mr. Wilkins and Mr. Garretson exchanged positions. E. E. Clark was grand chief conductor, which position was later called president, and Mr. Garretson was elected to that office in Sept. 1, 1906. Mr. Garretson was also president of the mutual benefit department of the order. He also served as a member of the executive committee of the American Railroad Employees and Investors association and served as a member of the National Civic Federation. During his administration as president of the O. R. C. he was appointed a member of the commission on industrial relations, which was appointed under the act of congress in 1912, for the purpose of ascertaining the conditions of labor and agriculture and relations between employers and employees. The commission reported in 1915. Following his resignation as president of the order, Mr. Garretson was made advisory counselor of the order, which position he held until he was pensioned. Mr. Garretson probably reached the peak of his career in the late summer of 1916 when he took the leading part in the Mediations which averted a nationwide strike of 400,000 railway workers, when the workers won the eight-hour day and pay of time and a half for overtime. Newspapers of the day credited him with winning by diplomacy and strategy a victory over the best railroad brains of the country, and the statement was made that for the three weeks the negotiations went on, Mr. Garretson came as near to being the absolute dictator of the country as any man may aspire to be. When the rail union leaders ordered a national strike for Sept. 1, 1916, after the unions and the railways had failed to get together and President Wilson’s efforts at settlement of the controversy likewise had gone for naught. Mr. Garretson began to loom as an outstanding national figure. The railways began a feverish enforcement of embargoes on perishable freight warned passengers contemplating long trips that their arrival might be delayed. President Wilson went before congress to ask legislation to avert the strike. He asked that the men be given the eight-hour-day, that the power be given him to draft men to run the lines in case of necessity, and that others laws enacted for the protection of labor and averting of future strikes. Congress put all other matters aside to devote its time to study of the proposed legislation. Appeals to the labor leaders to postpone the strike a few days were rejected by Mr. Garretson as spokesman for the brotherhoods. To postpone the strike after the men had voted for it would mean the disintegration of the unions and chaos he declared, standing fast against all moves to settle the controversy before the unions had won their demands. Congress pushed through the bill known as the Adamson act, to give the men the eight-hour day, and the final act of surrender of the congress and the president to Mr. Garretson and his cohorts came in the forenoon of Sept. 3, when Mr. Wilson signed the bill, less than 24 hours before the strike order was to go into effect. Mr. Garretson had been a resident of Cedar Rapids ever since 1889. On Sept. 4, 1873 he was married to Miss Marie Ream, of Somerset, Pa. To this union were born three children; Ivan, who is holding a railroad position in Chicago; Mrs. Everett Seely, who preceded her father in death, and Mrs. C. P. Kinyon, of Santa Ana, Calif. There are also three grandchildren, Garretson, Jane, and Betty Seely, and one sister, Mrs. Josephine Wilson, of East Oakland, Calif. His wife preceded him in death in 1926. Funeral services will be held in the Turner chapel Sunday at 3:30 P.m. C. H. Williams of the O.R.C. and an old friend of Mr. Garretson, will have charge of the services in accordance with an agreement made between the two men years ago. The agreement was to the effect that the survivor of the two would preside over the funeral ceremonies for the other. Mr. Garretson’s body will be cremated and the ashes will be buried in Oak Hill cemetery.